The start of every year is always the same thing. People are excited coming from the holidays and spending time with family they had not seen for the past year. The new year seems and even feels great, and most are hopeful that it will be the year tings turn around for them. For some, they are hopeful their businesses will grow. Some are hopeful that they will land their soulmates and some still are hopeful that they will travel the world as they have always wanted. And since the accomplishments of all these hopes and dreams require hard work and some level of consistency, New Year resolutions are made. Now, this is probably the best moment in every start of a new year. Unfortunately, these new resolutions don’t last as long; I should know. At some point in life, I was a professional in making and breaking my very own resolutions a month into the New Year. hit the gym every day the following 7 days. Then, at the slightest stumbling block, I would veer off my routine. The next thing I know, it’s a month since I exercised. I beat myself down and get into a whole emotional rollercoaster. Long story short, the year’s gym membership would go to waste. All progress made would regress, and I would be back to square one, a couple of hundred dollars poorer and my fitness worse than it was initially. You probably can relate to the cycle of events here. My turning point came when my husband (then boyfriend), took me out for dinner and called me out on my fitness and shape (or lack thereof). Of course, being a lady who is insecure about her body, I lashed out at him right there in the restaurant and stormed off. I did not think of why he would tell me such a thing and anything he had to say until a month later after he had apologized and all (agreed, I can be a drama queen at times). And when I finally gave it a thought, the seriousness of the matter and what was at stake hit me hard. So I made a resolution (I did not wait until the New Year for this). I will get back in shape no matter what it takes! I will try new methods of doing it as well. After all, madness is doing the same thing over and over and expecting different results. I hit the ground running looking for fitness alternatives. It took me several weeks, but I finally found what I was looking for. In the process of my search (before I tell you what it is I discovered), I realized the reasons why gym memberships did not work for me and many others like me. The reason was that having to head to the gym for a workout, not unless you live very close to your gym of choice, was a pain in the behind and a major inconvenience. Home-based exercises, on the other hand, give me back the control of how and when I work out without having to go out of my way for it. So back to my discovery. I stumbled upon the Bowflex Xtreme 2 SE which turned out to be easy to fit into my schedule and most importantly convenient. It has been close to a year now since I started using it and the progress made is profound. I thank my husband every day for gathering the courage to tell it to me as it is and taking the heat like a man. That day is imperative to how I look today. But enough about that and more on the fitness machine and what makes it my preferred choice and that of many as well. Reading this, it is safe to assume that you already have a clue of what this equipment is. But just so that we are on the same page, it is probably best we give a brief history of the equipment. 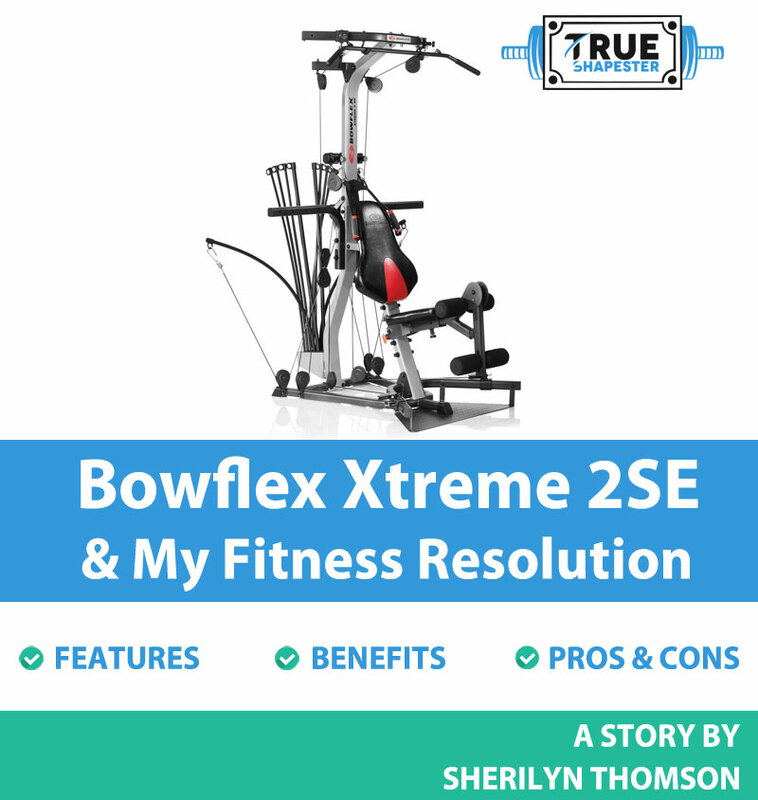 Now, Xtreme 2 is a product that was created and introduced into the market not so long ago by Bowflex which is a daughter company of Nautilus Inc. in addition to the Bowflex line. The company made available Schwinn Exercise, Stairmaster, and Pearl Izumi products. At the moment, however, the Xtreme 2 SE is currently one of the company’s best-selling products. The power rod configuration it makes use in the creation of constant resistance and tension for improved training results is patented. Part of the reason why the company has grown in popularity over the years is its compact nature, taking up less space in the home compared to complete set weights and other workout machines. Its features focus on cardio conditioning and strength, two elements that are ideal for getting any lady in perfect shape. As stated earlier, this home exercise equipment does not make use of any weight stacks for resistance generation. Instead, the unit uses power rods patented to its manufacturing company. These rods generate 210 pounds in resistance. You can, however, upgrade it to 310 or even 410 pounds if you so wish. You can increase the resistance of the unit in batches of 5 pounds. In addition to this, the equipment makes use of a cable pulley system that allows you to work out without changing the cables. This pulley system has 4 positions that combined work out all body muscles in different degrees and angles. The benefit of using this resistance system is that it makes available 70 plus exercises. Most of the home gyms can only provide 20 or 30 at a maximum. The unit also features leg extensions that will help you develop some strong leg muscles as well as an abdominal harness that will help you to target the abdomen. Other feature is the compact design. Despite the fact that this unit can perform a myriad of exercises, it has a tiny footprint. It will take up minimal space while in your home. The total workout space required when using this unit is 8 feet x 6.5 feet. The unit is 82 inches. You will, however, ensure you have a ceiling height higher than this so that you have ample room above as well. The unit weighs about 185 pounds. This, needless to say, is heavy even for my ripped husband to move around with ease. But nonetheless, it is significantly lighter than most units available that weigh close to 450 pounds. The unit features an adjustable seat. The seat has been constructed to be sturdy and strong and is covered in a polyurethane cushion thus providing ample support and comfort during workouts. Adding to this is a handgrip with an ergonomic design that adds to the comfort of the unit. It is also important to note that the hand grip is designed as a five way and includes different functions such as a non-grip cuff, a regular grip, a foot cuff, an ankle cuff and a shoulder cuff. The unit allows for strengthening of the back and shoulder muscles. The squat positions (4 variants in total), work to strengthen and tone the glutes, quads, and hamstrings. The leg extensions, on the other hand, will help you to work out the leg muscles and contribute to the building of muscular limbs. This is by far the greatest benefit for when you purchase this indoor workout gym. Working with this machine, I noticed that it has something for everyone. This versatility is difficult to come by in regular equipment. In the event, you need to work out with younger members of your family, or an individual who has mobility problems, you will benefit and fall in love with this unit. This cannot be said enough. The compact nature of this gym is impressive. It saves you a lot of space in the room. This is despite it having several stations and attachments. The X-shape the unit comes with provides it with great stability. So now the question is, should you get this home gym? Well, if you are tired of the expensive gym memberships and you are looking for an alternative without the hassles of traveling to your workout destination, then yes, this unit is one of the best there is in the industry. Adding to this, the unit actually works – trust me, I know. It provides workout opportunities to beginners who will ease into a proper workout schedule with time. This product is created from a durable and strong PVC material to protect the carpets and floors from the damaging effects of the heavy equipment. During workouts, it is normal to get so into it and have the unit moving. Even slight movement can over time damage your floor. The mat has a non-slip surface which holds the unit in place. The thickness of the mat also works to dampen vibrations from the movements during workouts. With this tool, in addition to prolonging the life of your exercise equipment, you also will extend the life of your floor. Now the Xtreme 2 has a 210-pound rating. As a beginner, this is more than enough. But as you progress and build muscle, you will need greater resistance to continue with the muscle growth. This is where this 310-pound upgrade rod comes in. The unit comes with two 50 pounds rods and has a 30-day warranty. This upgrade can fit also on the PR3000, Extreme, Blaze, Exceed, Sport, Power Pro, and Elite. I have been using this unit for close to a year now, and the results I have experienced are profound. I can’t imagine how I survived without it. Other users think the same thing too. The obvious advantages this unit bears make it lovable and a preferred choice. Rather than going back and forth the internet pages trying to land the best home gym equipment, I give you free advice, purchase the Bowflex Xtreme 2 Home Gym and reap benefits in a few months of using the unit.